Product #637 | SKU BE802 | 0.0 (no ratings yet) Thanks for your rating! 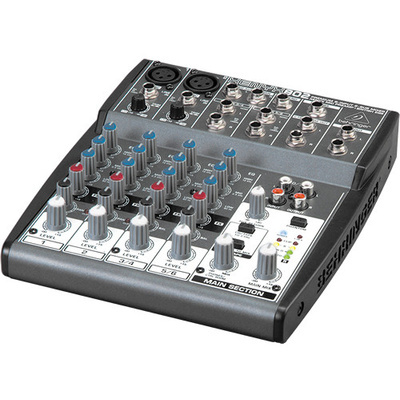 The XENYX 802 features a total of 6 line inputs on 1/4" Phone connectors and two XLR microphone inputs. Channels 3/4 and 5/6 feature stereo paired 1/4" phone line inputs for keyboards, recorders and other stereo devices. User switchable +48V phantom power is supplied to condenser microphones. The 802 features stereo AUX send and returns for routing channels to external effects processors, monitors or recording devices. The 802's ultra-compact profile is ideal for the road and easy storage.